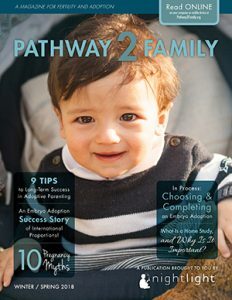 Creating a Family has a comprehensive set of resources on infertility and adoption. Dawn Davenport is a leading expert in adoption, infertility and orphan care, and the host of the top rated radio show on adoption and infertility in the US, Creating a Family: Talk about Adoption and Infertility. She is the Executive Director of Creating a Family, a nonprofit providing education for adoption and infertility. Creating a Family has won awards for excellence from both the US Department of Health and Human Services and the Congressional Coalition on Adoption. The radio show won the International Infertility in the Media award in 2010. Listen to these radio shows and search the website for current information and events.